> What's so special about HPB? We take your privacy seriously and we will only use your personal data in line with the provisions of current data protection legislation. We are the Promoters and Managers of the Holiday Property Bond issued by HPB Assurance Ltd who are registered in the Isle of Man company number 021075C. Our registered address is HPB Management Limited, HPB House, Old Station Road, Newmarket, Suffolk, CB8 8EH. HPBM is registered with the Information Commissioner’s Office and our registration number is Z5864533. We are part of the Quality Holidays Assured Limited group of companies. You can find more information about the other companies in our group here. This information is specific to the publicly available part of the website i.e. no password required. How do HPBM collect personal information? In addition, we will send unnamed postal advertising by using – for example – post code data rather than anything which personally identifies you. Referrals – this is a well established method of receiving the names of potentially interested parties from our existing customer base. It is carefully laid out that the individual providing the referee’s details to us is required to ensure that permission is sought from the person being referred. From an existing Bondholder who has registered you as a member of the ‘HPB family and friends website’. By receiving your information from prospective or existing Bondholders or directly from you as an Additional Life Assured (which may include sensitive personal data, such as health data). What information is used by HPBM? In addition, we will have a record of any browsing history on our web site HPBInsight which we may use to further personalise your experience. Because of the peculiarly long-term nature of the Holiday Property Bond, we will continue to send you marketing material for a maximum of 18 years since we last heard from you, unless you tell us that you no longer wish to receive our communications. There will be frequent opportunities to opt out of such material but in any event, you can stop receiving mailings and information by emailing details@hpb.co.uk or telephoning 01638 660066 quoting your name and postcode and asking to be removed from our mailing list. In first correspondence to the individuals referred to us, we will offer the opportunity to use a prepaid reply card to remove your name in case there has been any misunderstanding, or the rules have not been followed properly. In order to provide you with information on our products and services we need to collect, use, share and store personal and financial information about you. Our lawful basis for processing your personal data used in the creation of a Holiday Property Bond is in the pursuance of fulfilling the contractual obligations of your policy and to fulfil our legal obligations. Our lawful basis for providing you with marketing information on HPB and other group companies is consent. This consent is easily maintained or withdrawn on the MyBond area of the website www.hpb.co.uk or by telephoning or emailing us. Your details are collected when you complete forms, contact us or request information by letter, telephone or send us an e-mail. Personal data collected at point of sale including contact details and ‘special category’ data (for example: health information and copy proofs of identity and address) provided when you applied to become a Bondholder. This special category data will be destroyed on HPBM’s servers after a short time once HPBA (the life company) have confirmed their records are complete. HPBM will retain contact details and details of the investments to facilitate the running of your Holiday Property Bond. We may need to write, email or telephone you for example on a holiday related matter. Confirm compliance with ‘Anti-Money Laundering’ and ‘Countering the Financing of Terrorism’ regulations and guidelines. This may involve carrying out checks with credit reference agencies and other specialised databases in order to comply with our regulatory obligations. Correspondence records are held along with holiday and booking records. We will share information with HPB Assurance Limited (“HPBA”) for whom HPBM act as agent in the marketing and property management of the Holiday Property Bond and the provision of the holiday rights included within the Holiday Property Bond. Telephone calls are not currently recorded. We treat all information we hold about you as private and confidential. We will not reveal any personal details or details concerning your Holiday Property Bond to anyone not connected with the Quality Holidays Assured Limited group of companies, unless mentioned below. There is a duty to the public to reveal the information e.g. to governmental bodies, tax authorities or regulatory bodies. To complete and service your policy we are required to share your personal information with selected third parties, or those who are acting as our agents, to perform tasks for us to help service your Bond. These include payment providers; credit reference and other agencies who we may use for the provision of information to assess fraud, credit and/or other security risks. We will ensure that these third parties agree to treat your data with the same level of protection as if we were dealing with it. To prevent and detect fraud we may share your data with other organisations, including the police, and check and/or file your data with fraud prevention agencies and databases. 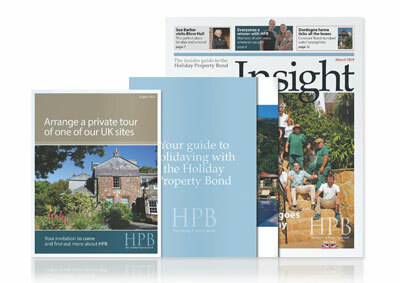 Your marketing preferences can be altered in the MyBond preferences section of the www.hpb.co.uk website. The data that we collect from you is securely stored on servers in Newmarket, UK, and in the Isle of Man. We will ensure that we have appropriate security measures physical, technological and contractual to protect your information regardless of where it is held. When we outsource any processes we will ensure that the supplier has appropriate security measures in place and will contractually require them to comply with current data protection laws. We will retain your data for legal purposes for a period of at least six years from the date the record was created or, if later, at least six years from the date that it ceases to be relevant. Because of the peculiarly long-term nature of the Holiday Property Bond, we will retain your data for a maximum of 18 years since we last heard from you, unless you tell us that you no longer wish to receive our communications. You are entitled to receive confirmation as to whether your personal information is being processed by us, as well as supplementary information relating to our use of your personal information. Your right of access allows you to be aware of and verify the lawfulness of the processing of your data. You have the right to require us to correct any inaccurate personal information we hold about you. You also have the right to have incomplete personal information we hold about you rectified, by providing a supplementary statement to us. The right to erasure does not provide an absolute ‘right to be forgotten’. we must erase your personal information to comply with any legal obligation we are subject to. you have objected to the processing (where it is necessary for the purpose of legitimate interests or the performance of a public interest task), and we are considering whether HPBA’s legitimate grounds override those of yours. We are handling your personal information pursuant to our contractual and legal obligations. If we process your data for the purposes of scientific/historical research and statistics. If you ask us to stop handling your personal data in this way, we will stop unless we can show you that we have compelling grounds as to why our use of your personal information should continue. We do not undertake any automated decision making (making a decision solely by automated means without any human involvement). We do not undertake profiling (automated processing of personal data to evaluate certain things about an individual). You have the right to lodge a complaint with the UK’s Information Commissioner's Office, the supervisory authority for data protection issues in England and Wales. Their postal address is Wycliffe House, Water Lane, Wilmslow, Cheshire, SK9 5AF, telephone 0303 123 1113. Our site contains links to the websites of other companies in the Quality Holidays Assured Limited Group. In addition there are links in the site to other useful external websites. For example, local tourist information close to our locations. If you follow a link to any of these websites, please note that you have left our site and these websites have their own privacy policies. You have a right to access the personal data held about you. To obtain a copy of the personal information we hold about you, please email DPO@hpb.co.uk or write to the Data Protection Officer at our address shown above.